German philanthropist and communal worker; died at Berlin June 22 (24), 1854. 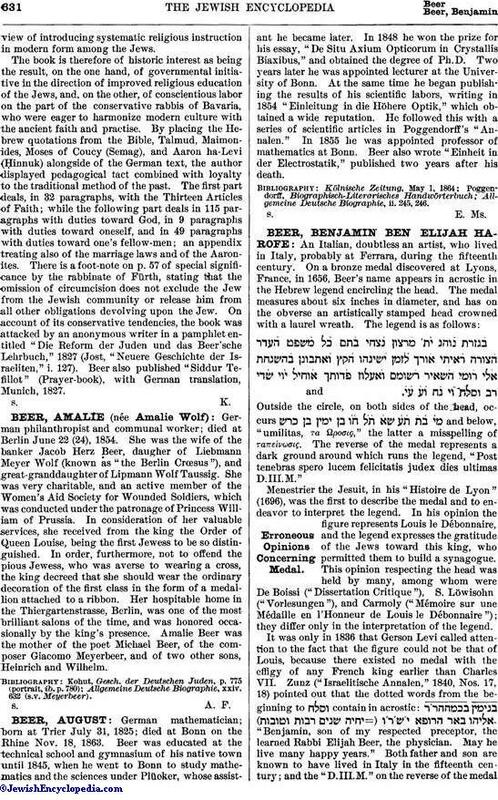 She was the wife of the banker Jacob Herz Beer, daugher of Liebmann Meyer Wolf (known as "the Berlin Crœsus"), and great-granddaughter of Lipmann Wolf Taussig. She was very charitable, and an active member of the Women's Aid Society for Wounded Soldiers, which was conducted under the patronage of Princess William of Prussia. In consideration of her valuable services, she received from the king the Order of Queen Louise, being the first Jewess to be so distinguished. In order, furthermore, not to offend the pious Jewess, who was averse to wearing a cross, the king decreed that she should wear the ordinary decoration of the first class in the form of a medallion attached to a ribbon. Her hospitable home in the Thiergartenstrasse, Berlin, was one of the most brilliant salons of the time, and was honored occasionally by the king's presence. Amalie Beer was the mother of the poet Michael Beer, of the composer Giacomo Meyerbeer, and of two other sons, Heinrich and Wilhelm. Allgemeine Deutsche Biographie, xxiv. 632 (s.v. Meyerbeer).